Many of the kids participating in CTO Texas' Ultimate Summer Camps are able to cover their entire camp cost through this raffle, since 100% of what kid's raise goes directly towards their camp balance. Tickets are $10 each or purchasers can buy 10 tickets and get 1 free, so that’s 11 tickets for $100. 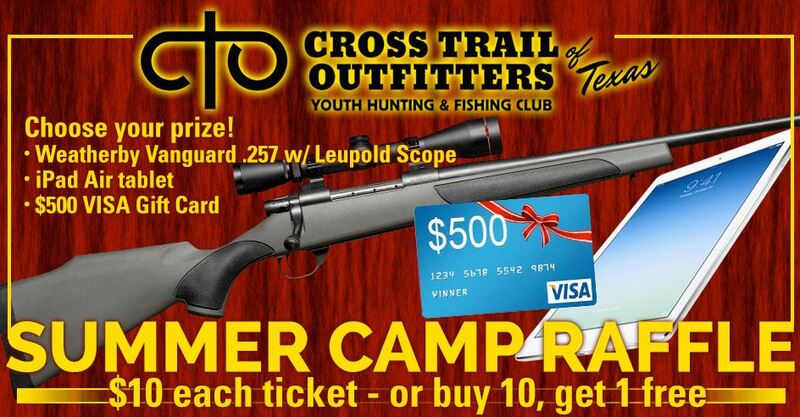 Purchasers can choose from 3 prizes—a Weatherby Vanguard.257 w/ Leupold Scope, an IPad Air or a $500 Visa gift card. Purchasers need not be present at the time of the drawing on August 15, 2017 to win. At the drawing, tickets will be separated into three separate buckets and winners for each prize will be drawn. The winner of each prize will be contacted after the raffle drawing by phone, and winners will be posted on the CTO Facebook page and CTO Texas website.